Featuring Special Purchase Premium Wood Mouldings Up to 70% off-Hurry, Limited Supplies, Plus Free Limited Shipping and Digital Printing. Rare Art Wanted For Fine Art Auctions. Check Out Fine Art At Auction bid on bargains. Frames for photos, artwork and memorabilia produced by folks with years experience in working with fine art and related framing. 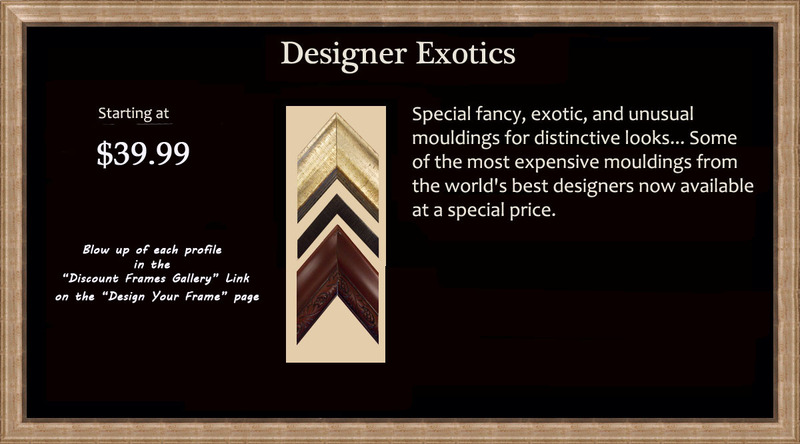 We offer premium real wood frames in our premium online custom picture framing service with multi coat finishes including fine gold and silver finishes not plastic or foil frames finished to look gold and silver which you can't even find in the discount stores. Our raw materials come from the major manufactures of premium mouldings, even from Italian master moulding designers and manufacturers. Some frames come from specialty woodworking shops and can feature expensive oak, hickory, maple, chestnut, mahogany and American pine. Whenever possible we offer genuine antiqued barnwood frames subject to availability. Because we are a small volume shop, we can take advantage of closeouts and other limited quantity situations and our customers get an opportunity to buy quality frames the big sellers would never bother with because of the small available quantities don't offer much profit potential. Free shipping is available for sizes up to 20 by 24 inches. Slight additional charge for larger sized shipping priced according to size and weight. Or if you are in our neighborhood, just stop by to pickup. Sorry shipping at this time outside the continental U.S. requires special packaging and will be quoted individually. Frames are made to your size requirements, true fine online custom picture framing. Add a mat or two or three for exotic effects. If a covering is needed for photos or works on paper, we provide a sized acrylic sheet with UV-3 protection. And if you send us a digital file, we can print it to the size you want to display (original resolution permitting). Click Here to get started with your order. First of All A Live Person is Available at Every Step just call 760-432-8995. Don't Get Frustrated With Hard to Manage On-Line Technology. Options: Order a frame, basic mat(s), backing and glazing and you put your art in it. We ship to you or you can pick up at our gallery. Alternatively send us a digital file with your framing choice. Digital files uploaded to us are printed in appropriate size and installed in the frame and matting of your choice. You chose the size. In most cases the printing and shipping are free. And yes we can create custom quotes for a variety of other projects. Let us know a little about your requirements by using the contact form at the bottom of the page. To see some of our creative options Click here. Perfect for style conscious decorators on a budget when you need to frame a poster, instagram photos, diplomas, certificates, awards, family photos, and selfies of particular merit. Just select your choice from our list of available online frames and online framing options and in a few days you have a high quality custom picture frame at an affordable price. Free Digital Printing** of your photo or art Files .Yes you can also email or upload a digital file for printing and framing. 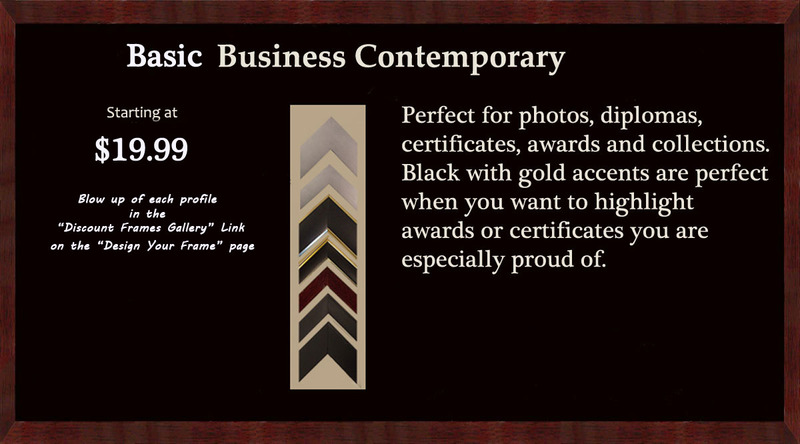 All from the company whose principles have over 100 years of experience working working with fine art and fine framing. 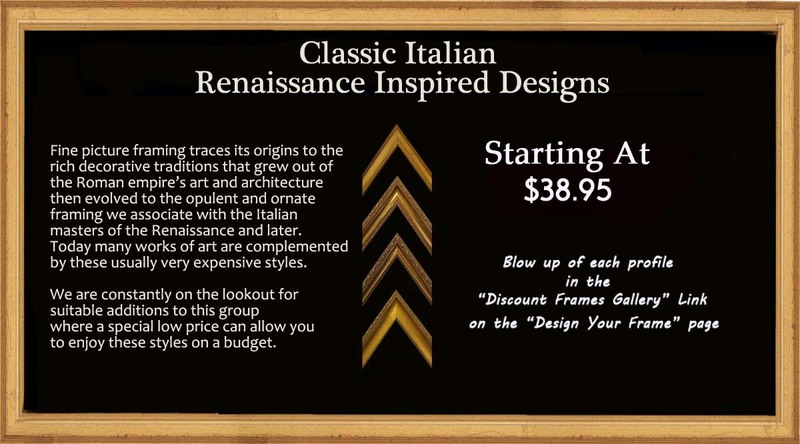 Yes we can send you any of our specially priced premium frames up to 60 in on the longest side ready for do-it-yourself projects without high shipping costs and packed to avoid damage. 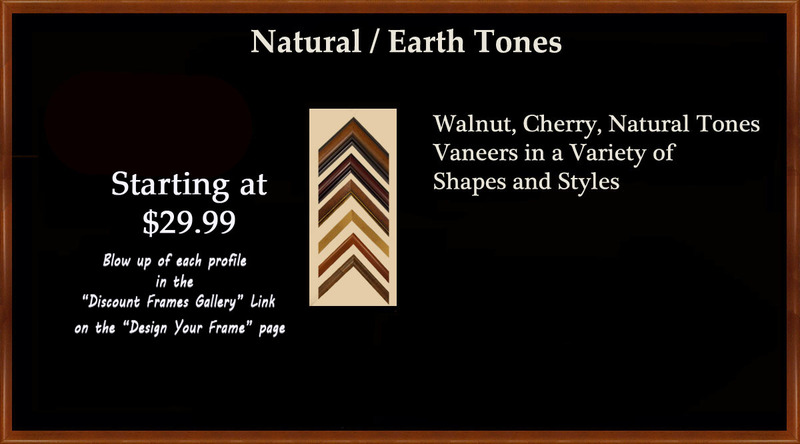 These frames are cut to your desired size and fitted with "thumbnails" slots. Just glue and press the included thumbnails from the back to hold the corners together, let the glue try and then mount your canvas or print materials (glass, acrylic, mat, backing). No special tools or vises required, just some stong glue and a small hammer. For more information about how thumbs work see this youtube tutorial.